From information literacy training to building infrastructure and outreach, librarians are critical to building a healthy research culture in the developing world and they are often the “unsung heroes” in the research ecosystem. 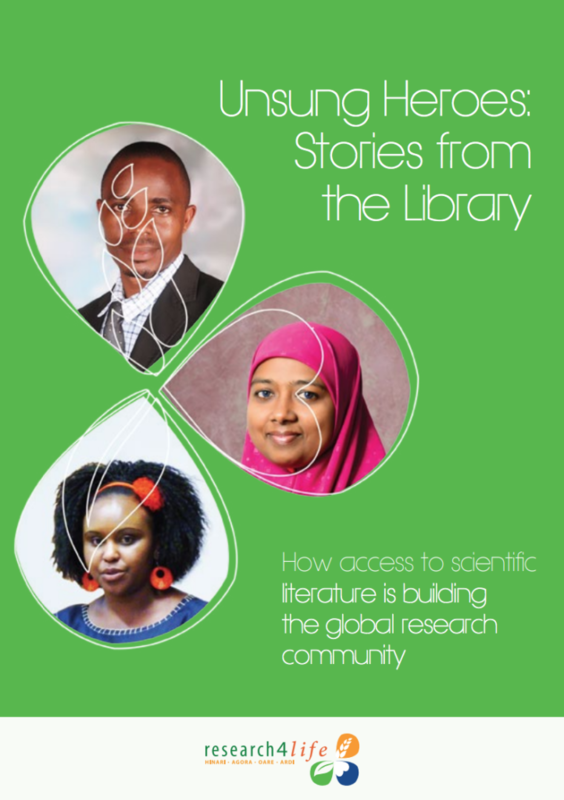 For this reason, Research4Life has commissioned a special booklet, “Unsung Heroes, Stories from the Library” – narratives from individuals around the world who have in reality become the unsung heroes of research in their institutions. Every day, these librarians train, assist and empower faculty, students, doctors, and staff in accessing and using vital information available through Research4Life and other resources, impacting not just the individuals work, but the extended community around them. These stories were chosen from a total 45 case studies which were reviewed by a Research4life judging panel of twelve international librarians and experts in research capacity building. All entries showed a clear pride and dedication of their work in supporting and building the capacities of their institution and nation’s research. These testimonials highlight librarians− Research4Life’s ambassadors – sharing their voices and exposing their role in the trends, challenges and opportunities facing research communities in the developing world. If reading this book inspires you to learn more, whether as a participating institution, publisher, technology partner, journalist, donor, or policymaker, please contact us at: communications@research4life.org.